Pharmaceutical corporation Bayer’s pesticides has been a huge contributor to the decline of the bee population, and on May 16, some 90+ activists gathered in San Pablo Park in West Berkeley, California, near where one of the Bayer facilities was located, to protest the company’s insect-killing. Many of the demonstrators were dressed up as bees. The goal of what was called the “Bee-in at Bayer” was to draw attention to the fact that Bayer’s chemicals are directly linked to Colony Collapse Disorder – the syndrome that leaves once-full bee hives empty and devoid of life. “All we’re saying is, ‘give bees a chance’!” declared one protester. “Bees for our nation, not your corporation!” cried another. And yet another demonstrator held a sign that read, “Honk if You Like Bees.” Many passersby did, indeed, honk. In fact, the protest reportedly received an enthusiastic and appreciative response. Finally, some of the activists also outlined the oft-ignored fact that Bayer once played a role as a chemical weapons manufacturer for Nazi Germany. 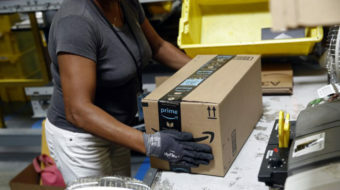 Another bee host said that her community of backyard bees slowly started to dwindle in numbers, and as she researched the situation, she realized that the culprits were two pesticides (Imidacloprid and Clothianidin), which are currently some of Bayer’s best-selling products. According to the Coalition Against Bayer network, one third of honeybees in the U.S. continue to die off per year. And although Bayer promised to suspend production of Class 1 chemicals that immediately threaten human health, it has neither said nor done anything about the ones that affect insects, plants, and animals. 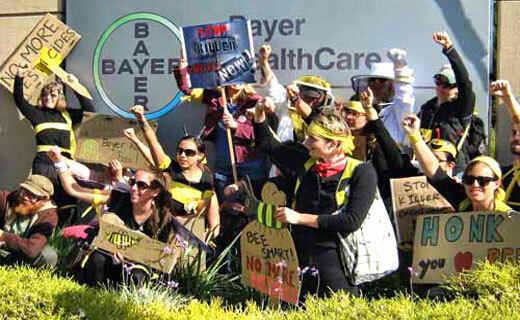 The activists eventually made a “beeline” for the nearby Bayer plant, where they were instructed to “swarm!” When no one working at the plant offered to meet with, talk, or listen to the protesters, a few organizers delivered a speech, culminating in the group symbolically presenting Bayer with the sarcastic ‘Poisoned Heart Award.’ That award was little more than a giant, lumpy sack dripping with a thick coating of Hershey’s chocolate sauce. Photo: The Coalition Against Bayer Network.